This recipe is really complicated. Pears are so quiet it's a bit of a feat to coax so much flavor out of them. 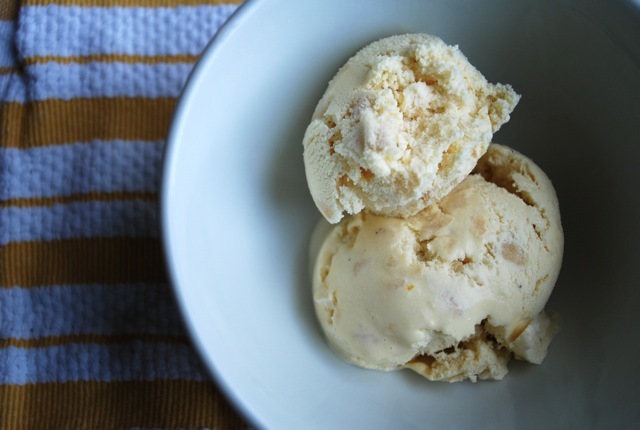 This ice cream has a deep pear flavor with butterscotch and vanilla undertones. Somehow light, true to the cream, and rich. Definitely time well spent. A note on the recipe: The inspiration for the pear preparation came from Sprouted Kitchen, where the roasted pears are the main attraction. I had been wanting to make a rich pear ice cream and her recipe seemed like it would bring out perfect pear flavors. I consider it a total success. Preheat the oven to 350 degrees. Combine the butter, sugar, honey and salt over medium heat and cook for two minutes. Things will be quite bubbly. Then add the pears and cook, flat side down, for 2 to 4 minutes. Then place in the preheated and cook for 15 minutes. Remove from oven and set aside to cool. Meanwhile, combine the cream and milk in a large saucepan and cook over medium heat until the mixture starts to steam. Add the vanilla bean and turn the heat off while the vanilla bean steeps in the cream for ten minutes. Put the yolks in a heat proof bowl and whisk in ¼ cup sugar. Remove the vanilla bean, scrape the seeds into the cream, and then reheat the cream mixture until it is starting to steam, and whisk a cup or so, ¼ cup at a time, into the eggs. The goal is the raise the heat of the eggs so they won't curdle when added to cream. When the eggs are tempered, slowly whisk into the cream. Stirring constantly, cook over low heat roughly 5 minutes, or until the cream mixture has thickened and coats the back of a wooden spoon. When the pears have cooled, remove them from the caramel and dice. Put the diced pears in a bowl, cover, and put into the refrigerator. Then stir the remaining caramel into the cream. Next, add 2 tablespoons rum to the pear cooking pan and deglaze briefly over medium-high heat for one minute. Scrape remnants into the cream and stir. Finally, add the tablespoon of vanilla. Pour into a large bowl, cover, and chill for a long time--3 hours or more is optimal. Process according to your ice-cream maker's instructions, adding the fruit once the ice cream is almost fluffy. You may need to make this in two batches. It also took a longer than usual processing time for the ice cream to set up. Remove from ice cream maker and freeze for as long as you can, three hours or more will result in a well-cured ice cream.